The following article was recently published about a week-long advanced flight training session HTC conducted for an official from the Albuquerque Police Department. The training was assisted by first responders from the White River Hazleton Fire Department and their Neoteric rescue hovercraft. Check back soon for full details and behind-the-scenes photos! MT. CARMEL - Neoteric Hovercraft, Inc. came to the Wabash River early Thursday morning to train several members of their one-week program. The trainers, Chris Fitzgerald and Steve Stafford, have been giving advanced lessons to the group on the technique of piloting the craft both day and night, the mechanics of how the craft works and learning how to navigate swift water. Albuquerque Police Officer Andy Montoya traveled from New Mexico to refresh his memory on the practices as well as learn how to pass on the skill. “I finally had the chance to train with Neoteric up here, and since I hope to retire in a few years I need to be able to train others to eventually take my place,” said Montoya. The group of trainees was out on the Wabash all day Thursday, staying until after dark to learn how to use night vision scopes and practice night rescue operations. 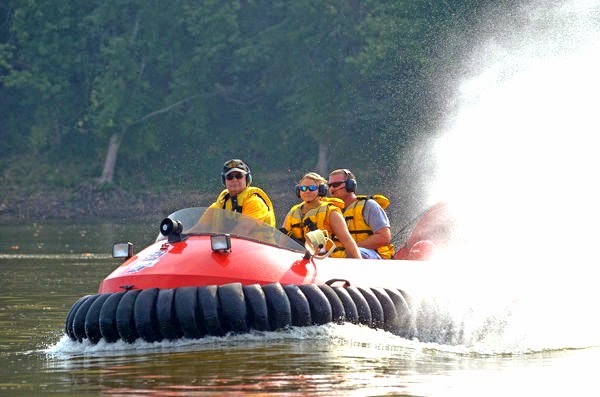 The White River Hazleton Fire Department have been involved in the past with three hovercraft rescues along the Wabash River, as well as several Gibson and Knox County rescues. Mark Ellis pilots the White River Hazleton Neoteric hovercraft with other members of Hazleton’s Volunteer Fire Department during the training on the Wabash Thursday morning. The craft hovers nine inches above the water and makes it easier to maneuver in shallow waters, meaning it can be an invaluable tool in rescue. The volunteers consist of at least seven people who have had experience with the hovercraft, two of which are accompanying Chief Mark Ellis in the program with Fitzgerald and Stafford. With the hovercraft balancing nine inches off the water, their experience can come in handy with the more advanced training over the rest of the week. Although balance has to be watched while on the craft, those nine inches can be a definite bonus in rescue. “The hovercraft can go right over a log, rocky shallow waters, sand, mud, you name it,” said Ellis. The versatility of the craft has become a vital tool in rescue throughout the years and, as with any tool, it will continue to be used to its best advantage with well-trained professions.